Peering into velvety, dark current hues, a pair of eyes gaze back at you from a dazzlingly colored face. 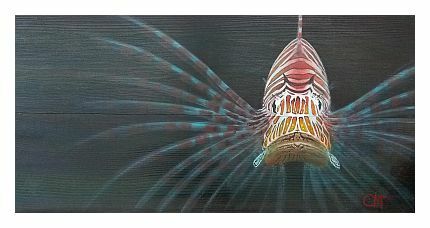 From the contrast of sharp tiger like stripes to the feathery light flare of the fins, this Lionfish is a creature to behold. 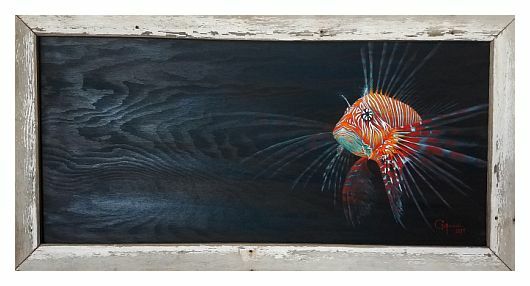 Painted on found wood, the heavy lines of the grain are like that of the water that suspends the fish in inky darkness. Courtney has worked professionally in more graphic forms of art that are evident in her technical approach. She is a vet tech as well and that love for wildlife is reflected in her subject matter and how they are conveyed. Courtney's use of found woods offers an incredible array of textures on her substrate. She seems to play with that effortlessly introducing shapes and compositions that flow. Each piece either invites you into a relationship with the sole occupant of the painting or sketches a narrative. Either way, it feels like one is immersed right into the company of what Courtney paints. Not only does Courtney paint on found woods but she also goes to great lengths to find interesting woods with which to frame the work. She recently dropped off a few new pieces that she was overjoyed to announce were finished in antique banister. They look amazing and add to the layers of rustic storytelling of the pieces. Currently residing in Philomath, Oregon, Courtney works with animals by day and continues her wild explorations with her family in her free time. New to the Ozone in 2017, we're excited to see her emergent body of work developing in impressive ways.